Megan says I go to a dark place before major events. She cites correlative evidence but I don’t feel any connection: maybe I’m too close to know. Anyway, I stayed in bed, uncommunicative, until 2pm on the day before our Chianti Blind tasting at the warehouse. I was profoundly incapable of rising. Megan read the situation and jumped ship for the farmer’s market and a small-scale construction project, finishing a tree house in her parent’s backyard. I lay motionless and fully clothed in a room that was warm and still, aware and unconcerned with physical discomfort. When I rose it was with a purpose. I decided to shower because being dirty isn’t cool, I dressed in all black to fit my mood, and I set out for the office. My car is a big dirt bomb littered with packing peanuts and granola bar wrappers, detritus and filth. It’s not cool, either, but I’m not tethered to it and anyway the thing takes longer to clean. The office was soothing: grey, organized, clean. Filtered light, no noise, no motion. When did chaos become the enemy? I posture like I’m on the side of chaos, in reality I find it profoundly upsetting. I need distance from sound, light, distraction. I need space to think. A blind tasting is an attempt to remove chaos and distraction from the playing field, leaving only the essential things, flavor, color, aroma, and texture on the table. The absence of codes, markers, aesthetic presets, the void permits more ruminative and creative thought about what our senses are being presented with in these crumpled brown paper bags. Twenty-eight brown paper bags, casually linked by the word Chianti. In some part due to my torpor preceding the tasting, the final hours had to be focused, on task. I wrote two pages of discussion topics to be distributed pre-tasting, and six pages of producer notes to be handed out once the sipping and spitting was done. I baked a pasta. I set up tables and chairs, bought glasses and more Chianti, 11th hour additions to the crowded field. Bread, cheese, crackers, plates, water pitchers, minutiae. Unthinking time. Chugging through a to-do list. If your life contains events such as these, you’ll recognize that by the time you reach this stage, the tablecloths-and-flowers stage, the event is really over. There’s nothing substantive that you can do to change its direction, short of having a meltdown or a moment of unlikely epiphany. Once the first participants found our front door (no small feat, I’d forgotten to send out the gate code to unlock the warehouse complex) my stress level/threat index descended a couple of color bars, my core reactor temperature returned to the normal range, and I settled into jokey small talk and the realization that no matter what type of event I was attempting to stage, this is the one we’ve got, and it’s time to roll with it. Parsing nuances between soundly made red wines from more-or-less the same place, made from more-or-less the same grapes, is pretty f-ing hard. 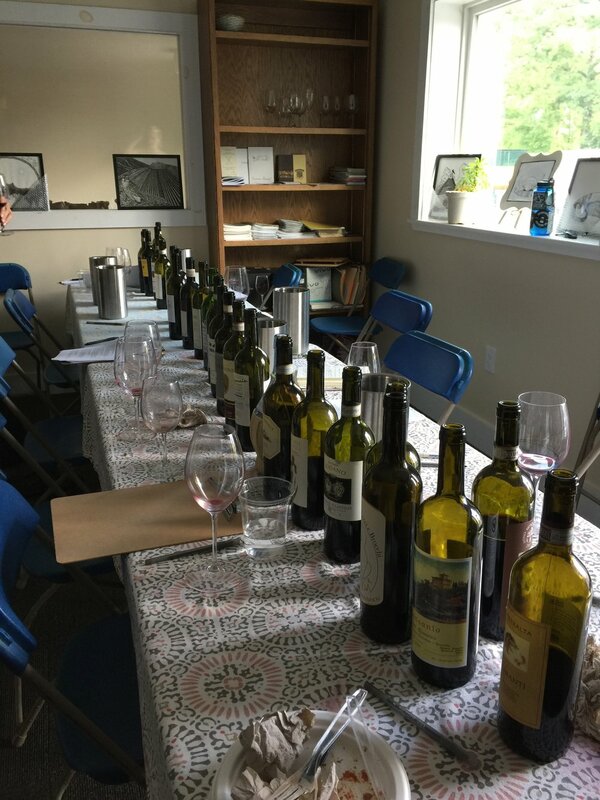 When it comes to long professional tastings this ain’t my first rodeo, and I’ve spent many days on the ground in Chianti in recent years, but… I need a guard rail. The benefits of tasting without preconceptions for me were probably outweighed by the hinderance of tasting without context. I set up this tasting to learn about the terroir of Chianti. I chose clusters of wines from the distinct sub-zones of greatest interest to wine nerds (ok me.) I picked a variety of production styles and types of wineries, but kept it to producers relevant to the discussion “what is Chianti.” Small innovators, large shippers with solid reputations, new age farming zealots, affluent and established boutique wineries. The process was taxing. Everyone took breaks. Still, getting through the last eight wines took an eternity. In the final stretch I had to taste most wines multiple times because my senses were shutting down. Other participants talked about the need to nap, and it wasn’t simply alcohol: we were spitting. It was exhaustion, overload: our taste buds had packed up and gone home for the day. A cluster of participants newer to this nonsense didn’t even try to taste all 28 wines. Smart. Know when the opportunity to learn has ceased. I learned a thing or two. At the end of the day the wine I wanted with my dinner wasn’t one of the cool kids. In hindsight, I found the iconic wines in the line-up underwhelming, the natural wines were interesting and relatively easy to pick out, and the more “industrial” stuff was less offensive flavor-wise than I expected it to be. Hollow maybe, in some places too polished, but not gross. Here are my notes on the wines. They aren’t profound. Stopping reading at this point might be a sound decision. My tasting notes follow the estate name, the rest is background info that I handed out at the end of the event, for discussion/context. #1: 2013 Nipozzano Chianti Rufina Riserva – Woodsy, lightweight, hollow mid-palate, clipped finish. Key fact: A longstanding member of the external Chianti consortium, Frescobaldi make Chianti Rufina at their headquarters in Nipozzano, near Pontesieve, 35km north of Florence. They are an ancient family of Florentine aristocrats, and fierce rivals of the Antinoris. 90% Sangiovese and 10% other varieties (Malvasia Nera, Colorino, Merlot and Cabernet Sauvignon. Aged for 24 months in French barrique. #2: 2014 Frascole Chianti Rufina – Much more aromatically intense. Animal, lots of length and intensity. Key facts: Fifteen hectares of high-density, low-yield hand harvested fields (and 9ha of olives.) A small, family-owned and operated farm that's been practicing organic agriculture since 1998. The vineyards are 500m above sea level. 90% Sangiovese, 5% Canaiolo, 5% Colorino. Clay loam marl soils. Vineyards planted in 1970, 1996, and 1998. Indigenous yeast fermentation in steel and concrete tanks. Half the wine is aged for 12 months in French barrique. #3: 2013 Fattoria Castellina Chianti Montalbano – Smells real. Smoky, stony. Real good. Key facts: Four hectares of certified biodynamic Sangiovese planted to a density of 4,000 plants per hectare. South-facing vineyard, 250m above sea level, sandy soils. Aged for 12-18 months in big neutral barrels. #4: 2015 Fattoria Castellina Chianti Montalbano – Alive, bright, fresh red fruit. Clean, delicate. Key Fact: Elisabeta Montomoli and her daughter run this estate with the help of oenologist Ivan Chirico. It’s a coastal vineyard area: on a clear day you can see the Tuscan coast from this hillside. #5 2012 Fattoria Castellina Terra e Cielo Older. Caramel. Madeira. Still alive, but to be drunk soon. High toned. Key facts: This alberello-trained vineyard is plowed using a draft horse. It’s from a .6ha vineyard with limestone/sand soil. 100% Sangiovese aged in French Tonneau for 20 months. #6 2015 Ruffino Aziano Chianti Classico – More chocolate. A little strange texturally – acidified? Key facts: 80% Sangiovese, 20% Cabernet Sauvignon and Merlot. Aged for 11 months in stainless steel and four months in bottle. From disparate vineyard sources around the Chianti Classico zone, including purchased fruit. Owned by the Folonari family, Ruffino are historically significant and powerful wine merchants who started acquiring vineyards in Chianti Classico and elsewhere over the latter half of the 20th century. #7: 2014 Corzano e Paterno Terre di Corzano Chianti – Red fruit and flint. Light/delicate. Key facts: Certified organic. 90% Sangiovese, 10% Canaiolo. Manual harvest from the 24 September until the 7th of October. Ageing in used barriques and 25hl and 40 hl oak barrels for 12 months. 29,000 bottles produced. Family owned, estate-bottled on a farm that also produces sheep’s milk cheese and monovarietal olive oil. Kay facts: Certified organic. 90% Sangiovese, 10% Canaiolo. Manual harvest from the 21 September to the 1st of October. Aged 50% in French barrique and 50% large barrels (25hl.) The estate has 17ha of vineyard and produces 80,000 bottles of wine annually. #9: 2015 Corzano e Paterno I Tre Borri Sangiovese Toscana – More garnet/purple color. Transparent. An odd aroma. More sweet fruit on the finish. Key facts: Certified organic. Sangiovese 100% Manual harvest between the 21st and the 30th of September. Fermentation in small 10 hl containers. Aged in barriques and 25hl barrels for 23 months. 8,900 bottles produced. Corzano’s vineyards are 300m above sea level, and south-southeast facing. I Tre Borri is their bottling of the best Sangiovese vineyard from a given vintage. #10: 2016 Montesecondo Rosso Toscana – Funky animal red cherry candy. Key facts: Organic since 2003. Biodynamic methods. Native yeast fermentation in concrete and amphora. Low sulfur. 100% Sangiovese grown on clay-limestone soils. #11: 2015 Antinori Peppoli Chianti Classico – Mid-weight with some tannin. Good clarity/accessibility. Key facts: Peppoli was purchased by the powerful merchant Antinori family in the 1980s. It is a 100 hectare (247 acre) farm in the center of Chianti Classico, half of which is planted to vine. Fermented in temperature-controlled stainless steel (26-28C.) It is aged for nine months in large Slavonian oak casks. #12: 2015 Castello di Ama Chianti Classico – Pleasant. Bright. Key facts: A historic estate that was resuscitated by Roman investors in the 1970s. Sixty-five hectares (161 acres) of vines grown using open lyre trellising at 480 meters above sea level. 40ha of olives. Marco Pallanti of Castello di Ama was head of the Chianti Classico consortium. This estate-bottled wine is sourced from four vineyards, with vines averaging 8-10 years in age. These modern clones are planted at a density of 5,200 vines per hectare. #13: 2012 Montevertine – Easy. Good. Key facts: Montevertine sits three kilometers from Radda in the heart of the Chianti zone. The estate has been in existence since the 11th century. Sergio Manetti, father of current proprietor Martino Manetti, purchased the 10-hectare property in 1967. All wine at this estate is hand harvested, never pumped but instead moved using gravity, and bottled without filtration. #14: 2015 Monteraponi Chianti Classico – Funky. Reductive. Key facts: The winery extends over an area of 200 hectares set in a natural amphitheater, which is exposed to the south and sheltered from the north winds. The vineyards are spread over 12 hectares, the olive trees over 8 hectares, while the remaining area is covered with towering, ancient oaks and chestnut trees. Harvesting, which usually begins in early October, is done by hand. #15: 2015 Vignavecchia Chianti Classico Ripe red fruit “classic” Sangiovese aromas. Nice balance. Key facts: 90% Sangiovese and 10% Merlot. Aged in French and American barrels for two months. Family-owned since 1840. Vineyards are 500m above sea level. #16: L2016 Caparsa Rosso di Caparsa – Very clean approachable aromas. Some candied red fruit. Method of fermentation: Hand picked, destemmed, fermented with native yeasts in concrete tanks then aged in very large neutral oak for two years then two years in the bottle before release. 833 cases produced. #18: 2014 Gabbiano Chianti Classico – Seems legit. Key facts: A 147ha property surrounding an 12th century castle. Certified sustainable farming. Ninety percent Sangiovese, the rest is Merlot, Cabernet Sauvignon, Cabernet Franc, Syrah, Petit Verdot , Colorino, and Malvasia. Temperature-controlled fermentation in tank, followed by 8-10 months of ageing in 15-50hl French oak casks. #19: 2015 Monte Bernardi Retromarcia Chianti Classico – Fresh dark fruit. Some tannin, balance. Key facts: Nine and a half hectares of vineyards at 350m above sea level in southernmost Panzano that look down on the Pesa river. Organic farming. Ninety-five percent Sangiovese, three percent Merlot, two percent Canaiolo Nero. #20: 2014 Monte Bernardi Chianti Classico straw basket – Red fruit. Tasty. Key facts: Owner Michael Schmetzler favors 1980’s clones of Sangiovese with larger, slower-to-ripen grapes with thin skins. Low-density plantings, close to the regional minimum. Schmetzler harvests variably ripe fruit and doesn’t use a sorting table. He uses large oval German and Austrian oak casks for fermentation and aging. #21: 2015 Castello dei Rampolla Chianti Classico – Tastes a little more oxygen exposed. Older barrels maybe? Tastes old school. Source: Chapel Hill Wine Co.
Key facts: Sangiovese, Cabernet and Merlot. Aged for eight months in concrete tank, 12 months in barrel and six months in bottle. 25-40,000 bottles made annually. Biodynamic farming practices are used at the estate. Owned by the di Napoli family since the 1960s. Key facts: vinified in steel without temperature control. From high elevation bush vines, organically farmed. Aged in 100-year-old 15-25hl chestnut barrels. The soil is Macigno, which is compressed sandstone (arenaria in Italian) with traces of Silicon. 95% Sangiovese, 5% Malvasia Nera. Wild yeast fermentation, 1,200 cases made. #23: 2015 Fattoria Rodano Chianti Classico – Smoky/funky aromas. Key facts: The estate was purchased by Enrico Pozzesi’s family in 1958. Today he is agronomist in his family’s 34ha of vineyards. The farm is 250m above sea level, with mostly clay soil. The wine is 90% Sangiovese, 5% Canaiolo, 5% Colorino, matured for two years in Slavonian oak casks. #24: 2015 Felsina Chianti Classico – Distinctly green pea aroma. Herbaceous. Underripe. Key facts: Southwestern exposure, 320-420m above sea level. Roughly a mile north of Castelnuovo Berardenga. Alberese and alluvial pebble soils. Fermented in temperature-controlled stainless steel, followed by 12 months in Slavonian oak. 100% Sangiovese, 5,400 vines per hectare. Harvested in the first three weeks of October. #25: 2014 Lecci e Brocchi Chianti Classico – Seems nice. Light, Balance. Typical. Key facts: Run by second-generation winemakers Sabrina Lastrucci, her husband Giancarlo, and young son Giovanni. Vines are planted at 420m above sea level on ferrous red soil (akin to Galestro) to the east of Castelnuovo Berardenga. Two hectares of vineyard. Bush-trained alberello vines, Sangiovese, Malvasia Nera and Canaiolo. Winemaking in concrete, stainless steel, and old barrels. Lecci e Brocchi are in the process of being certified organic. Very old vines. #26: 2013 Monsanto Chianti Classico Riserva – Weird. Also has some Cab herbiness (no Cab in this: ha! -ed.) Not what I expected. Key facts: 90% Sangiovese, 10% Canaiolo and Colorino. Vinified in stainless steel and aged for 12 months in 50hl Slavonian oak. Owned by the Bianchi family since 1961. The vineyards are 310 meters above sea level facing San Gimignano to the west. Galestro soils. #27: 2015 Montenidoli Il Garrulo Chianti colli Senesi – Natural. Old school. Traditional. I like it. Key facts: Elisabetta Fagiuoli moved to this estate in 1965. Il Garrulo" refers to the noisy chirping of birds in general, similar to happy diners enjoying wine, and to Garrulus, a particular bird that walks on the winery’s roof in winter. This estate practices organic farming methods. At Montenidoli, all the fruit is harvested by hand in small baskets to minimize damage to the ripe grape clusters. Harvest usually starts in late September or early October. The vines are east-facing, are planted perpendicular to the slope, in line with an old stream bed, for correct drainage. In 41 years they have never used an herbicide. Elisabetta writes, "We do not use insecticides; the vineyards are aglow with fireflies by night and dancing with ladybugs by day." #28: 2015 Pietralta Chianti – Smells good. Red fruit. Lean. Good. Key facts: Organic farming, 350m above sea level in stony clay soil. Ninety percent Sangiovese, five percent Canaiolo, five percent Colorino. Vinified in temperature-controlled stainless steel and aged in enamel-lined cement tanks, 12 months in tank and three in bottle before release. 5,000 bottles produced.